We’re big fans of Barbapapa at our house and if you were raised in the USA, you probably have no idea what I’m talking about. And the irony of it all is, Barbapapa cartoon characters were created by two American artists, but somehow they ended up being popular everywhere in the world except in the US! 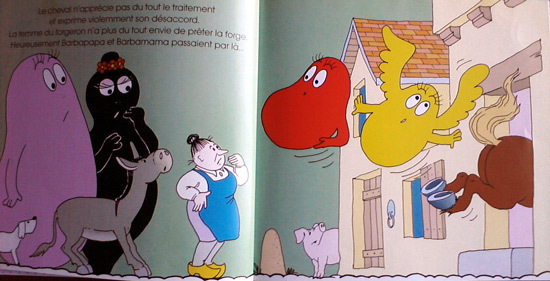 I watched the Barbapapa episodes on TV when I was a little kid (at least when we finally got a TV set) and later came the books. I now have all the original episodes on DVD for my kids to watch, as well as a few Barbapapa books. Then earlier this week, I borrowed a Barbapapa book from my son’s school library and we enjoyed reading it. 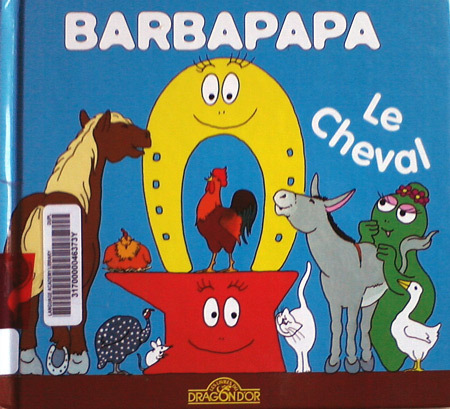 It’s called Barbapapa – Le Cheval (The Horse). Eventually the job gets done and Barbidur (the red one) gets overzealous and suggests to put shoes on the cow’s hooves. 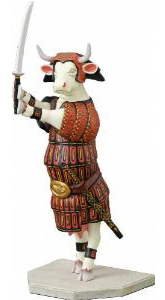 Who knew a book called Le Cheval would feature a cow?! How’s the painting class going . . . have you painted a cow yet? That’s why I loved the cartoons so much, besides their great themes about kindness, and caring about others and the environment. No, I painted a tree last week and my pine tree looked more like a palm tree. The teacher wasn’t very helpful in getting me there either. I missed today’s class because my son had surgery. And it was about washes, which I have no idea how to do. Thank god for the internet to learn! Washes are fun to play around with . . . wet the paper, use “wet” paint, and let it bleed from area to area. Nice! Washes look like a lot of fun and I see a lot of tutorials online so I’ll have to check them out. My son had hernia surgery and besides the overall acheness and the lack of appetite, you wouldn’t know. He’ll get to rest over the weekend and should be back to school on Monday. Fun times! I always love Barbapapa. Don’t remember any cows though. 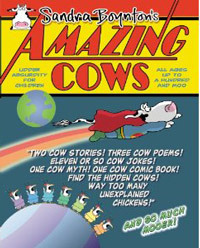 I don’t remember ever seeing cows in the original cartoons so the cow in this book called the horse quite surprised me.